A detailed guide to round-the-world air fares and ticketing - how to construct the best RTW itinerary including multiple stops, and air passes, by Hugo van Reijen and more from Smart Travel Asia and Dancing Wolf Media. 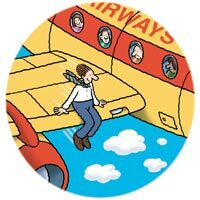 The ins and outs of hair-pulling round-the-world fares and some possible solutions like airline alliances, an air pass, or simply leaping out of a high window. SINCE we were kids in school we’ve been spinning toy globes and dreaming of setting off like Indiana Jones, rawhide whip in hand, to explore mystic places and virginal dark continents, untarnished by mind-numbing math theorems and grumpy gerunds. Today the world has shrunk and information now travels on optic fibres at the speed of light. Vicarious thrills have given way to vacations of a lifetime, but working out a round-the-world holiday fare is still a daunting task, equally so for the Indiana Joneses as for Wall Street Gordon Gekkos. To begin with, do you know how to spell Ouagadougou? Until fairly recently, my insatiable appetite for intercontinental travel involved regular visits to KLM to purchase complicated full-fare round-the-world tickets that would stymie the sharpest accountant or travel clerk. The number of individual coupons in these bulk tickets varied from 50 to 70. Then, “brick” in my pocket, I sallied forth to a vast number of points in Asia, Europe, South America and the Pacific. Sometimes a few destinations in Africa were also included. I always purchased my tickets in Karachi or Colombo, because these were the cheapest points of sale and, more often than not, I used my coupons out of sequence. This enabled me to extract the greatest advantage from the so-called MPM (maximum permitted mileage system) where if your TPM (ticketed point mileage), or actual miles flown, was less than the permissible MPM, you were allowed to stretch routes and points along the way, with certain caveats. The airlines tolerated, accommodated, and even encouraged this. This was possible with paper tickets. Such adventures are virtually impossible today with the electronic e-tickets now in general use, although very rarely paper tickets are still issued. Full fare round-the-world tickets were an important tool for the world traveller, enabling visits to several destinations with just one ticket. This was thanks to the extensive possibilities tossed up by the maximum mileage system and the extensive ticketing agreements that airlines had with each other. Airline spoilsports have put an end to that and the number of “coupons” in a ticket is now restricted to just 16. Airlines have also terminated several ticket agreements with a number of carriers, so that the option of including certain exotic sectors is no longer available. The aim of most airlines today is to keep the passenger on their own network or on that of their partners for as long as possible. As a consequence, the passenger who plans a complicated journey has to purchase a number of different tickets, which in many cases involves more work and usually a higher cost of travel. Several airlines offer a cooperative special round the world fare, restricted to the aforementioned 16-coupon maximum. Surface segments usually are also counted as a flight coupon or sector. We have listed some specials below but be aware that every fare is tied to a number of conditions and exceptions too numerous to be mentioned in this report. The products on offer constantly change and so do the myriad conditions attached to these fares. If you plan to book such a journey, visit the website of your chosen airlines or, better, sit down with your travel agent to work out the most optimal routing. The oneworld (www.oneworld.com) airline alliance includes carriers like Cathay Pacific, American Airlines, British Airways, Finnair, LAN, Malev, Mexicana, Qantas, Royal Jordanian, Iberia and JAL among others, covering 700 destinations around the globe. See our frequent flier survey for more details. This alliance offers its oneworld explorer (www.oneworld.com) with fares based on the number of continents included and with no mileage or directional restrictions. Zone A: Europe and Middle East: all Europe and the Middle East plus Egypt, Sudan, Algeria, Morocco and Tunisia. Zone B: Africa: all of Africa except Egypt, Sudan, Algeria, Morocco and Tunisia. Zone C: Asia: all of Asia except areas that fall within the Middle East. Zone D: Southwest Pacific: all of Australasia. Zone E: North America: USA, Canada, Mexico, Caribbean, Bermuda, Central America and Panama. Zone F: South America: all of South America except Panama. The economy class round-the-world fare is around HK$25,350 (US$3,250) if just three continents are visited, HK$29,220 (US$3,746) if four continents are involved, HK$35,250 for a five continent hop and HK$41,270 (US$5,291), if the journey traverses six continents. The same product is sold in business class for HK$70,910 (US$9,091) for three continents, HK$80,010 for four, HK$91,180 for five and HK$92,340 for six. The first class round-the-world ticket amounts to respectively HK$103,390 (US$13,255), HK$116,000 for two zones, HK$129,960 for three and HK$143,460 for four zones. In addition to these fares, surcharges and taxes need to be added. These levies vary according to the route flown and airlines used and can amount to a few thousand dollars more. The maximum number of segments one may fly in any single continent is four. For this reason extensive travel in any one continent/zone is not possible. For greater freedom of movement additional tickets have to be purchased and in many cases the purchase of air passes for this additional travel can make the journey cheaper. A sample route originating in Asia for four continents is: Hong Kong – Tokyo – Helsinki – Rome – London – New York – Toronto – Los Angeles – Sydney – Cairns – Hong Kong. An example of a route covering six continents could be: Hong Kong – Johannesburg – Victoria Falls – London – Zurich – Madrid – New York – Sao Paulo – Santiago – Auckland – Sydney – Cairns – Tokyo – Hong Kong . Oneworld cooperates with a number of other airlines, which are not members of the alliance, and offers a RTW pass in conjunction with them called: Global Explorer. The fare level of this product depends on the number of miles flown. Tier one: for up to 26,000 miles (economy class only), the fare from Hong Kong is HK$25,250 (US$3,237); from the UK it is 1,849 pounds sterling. Tier two: for up to 29,000 miles flown (economy class only), from Hong Kong, the fare is HK$29,220, and from the UK £2,139. Tier three: for up to 34,000 miles from, from Hong Kong the fare is HK$35,250 or US$4,519 (economy class), HK$80,010 or US$ 10,257 (business class) and HK$116,000 or US$14,871 (first class). Tier four: for up to 39,000 miles flown (economy class only), the fare from Hong Kong is HK$41,270, and from the UK it works out to around £3,099. Some sample itineraries for this round the world routing are: Melbourne – Hong Kong – London – Madrid – Chicago – Los Angeles – Melbourne (26,000 miles); or Sydney – Perth – Johannesburg – London – New York – Los Angeles – Sydney (29,000 miles); or Sydney – Los Angeles – New York – Miami – Buenos Aires – Lima – Santiago – Madrid – Paris – Budapest – London – Hong Kong – Sydney (34,000 miles). Passengers who wish to explore more extensive itineraries can combine their RTW ticket with one or more of the following regional oneworld tickets, of which some examples follows. The oneworld Circle Atlantic fare covers Europe, the Middle East, North America and South America in either direction. Trips are available in three different mileage bands: 17,000 (four stopovers allowed), 21,000 (five stopovers) and 25,000 miles (with six stopovers). The fares are roughly as follows (departing from the UK): 17,000 miles, £1,349 in economy class, £3,999 in business class, and £6,799 in first. For 21,000 miles it costs £1,649 in economy class, £4,599 in business class, and £7,799 in first class while for 25,000 miles the fare is £1,909 economy, £5,249 business, and £8,799 in first class. Expect further taxes and surcharges on top of these prices. Sample itineraries could be: 17,000 miles: London – Madrid – Santiago – Miami – New York – London; 21,000 miles: New York – Amman – Madrid – Buenos Aires – Mexico City – New York (US$4,000 in economy class, US$8,600 in business and US$11,900 in first). With 25,000 miles under the belt do Madrid – Buenos Aires – Santiago – New York – Vancouver – London – Helsinki – Madrid (2,609 euros in economy class, €6,359 in business class and €10,229 euro in first class. As with all air passes, some penalties may apply regarding date changes, re-routings, cancellations and refunds. The oneworld Circle Pacific covers routings around the Pacific Ocean covering Australia and New Zealand, Asia, and North and South America with a minimum of three continents included in the journey. Examples of fares applicable from Hong Kong are: 13,000 miles at HK$18,970 (US$2,432) in economy class, HK$35,750 in business class, and HK$51,040 in first class; 17,000 miles for HK$21,640 economy, HK$41,380 in business, and HK$58,940 in first class. The oneworld Circle Asia and Southwest Pacific option offers the possibility of an intercontinental tour of Asia and Southwest Pacific for travel originating and terminating in Northeast Asia, Southeast Asia or Southwest Pacific. This fare is only for travel originating and terminating in Taiwan, Korea, China, Japan, Hong Kong, Singapore, Indonesia, Thailand, Malaysia, Philippines, Vietnam, Cambodia and Southwest Pacific (Australia and New Zealand). The price depends on the country where the journey begins and ends. Travel must be on British Airways, Cathay Pacific, JAL, Qantas or their affiliates. Some sample itineraries are: 13,000 miles including Hong Kong – Singapore – Perth – Sydney – Tokyo – Hong Kong at HK$18,970 (US$2,432) in economy class, HK$35,750 in business class and HK$51,040 in first class. Bump up to 17,000 miles flying Hong Kong – Beijing – Tokyo – Melbourne – Singapore – Bangkok – Hong Kong for HK$21,640 (US$2,774) in cattle class, HK$41,380 in club and HK$58,940 in the first class cabin. Another option is the SkyTeam Round The World Pass. The SkyTeam (www.skyteam.com) combine consists of Air France, KLM, Alitalia, China Southern, Czech Airlines, Delta, Korean Air, Aeroflot and Aeromexico with Air Europa and Kenya Airways as associate carriers. See our frequent flyer survey for more details. With a Skyteam RTW Pass travellers can choose from 856 destinations in 16 countries. The validity period is one year. The cost of the pass is based on the number of miles flown, for instance: €2,599 for 26,000 miles in economy class, (say Amsterdam – Mexico City – Minneapolis – Los Angeles – Tokyo – Bangkok – Amsterdam). Ex-Seoul a typical round the world fare could be 3,696,600 Korean won or US$3,005 (economy class, 29,000 miles flown) shuttling Seoul – Rome – Paris – Prague – New York – Atlanta – Lima – Mexico City – Los Angeles – Honolulu – Seoul (W6,682,400 or US$5,432 in business class and around W13,094,200 or US$10,645 in first class). It works out to €3,549 in economy class to fly Paris – New York – Miami – Atlanta – Sao Paulo – Mexico City – Los Angeles – Honolulu – Tokyo – Bangkok – Paris (€7,562 in business class and €14,127 in first). When buying a first class pass, prospective round-the-world travellers should take into account that between many cities there is no first class option because of the aircraft type or configuration. In such instances the passengers will be downgraded to business class without any refund, although on such segments the first class baggage allowances will still apply. When deciding on your class of travel it is also worthwhile taking into account that on certain flights you might – at short notice –have problems getting your seat confirmed. Confirmation in business class is usually much easier. In combination with the Skyteam Round The World air pass a number of regional air passes are sold, of which the most important ones are the America pass, the Asia pass, the China pass and the Europe pass. The America pass offers between three and ten coupons and costs between US$569 and US$1,269, depending on the number of coupons and the season. If purchased in combination with travel from Europe, the price varies from around €489 to €1,159. The Asia pass costs US$600 for three coupons, US$784 for two coupons, US$960 for five coupons and US$1,128 for six coupons. Destinations include Australia, China, Fiji, India, Indonesia, Japan, Malaysia, Northern Mariana Islands, Micronesia, Mongolia, New Caledonia, New Zealand, Palau Islands, Philippines, Singapore, South Korea, Taiwan, Thailand, Guam, Vietnam, Cambodia, and Nepal. When travel between South Korea and South West Pacific is included, two extra coupons can be issued for US$360 per coupon. The China pass costs between US$300 (1,500 miles flown) and US$1,300 (8,000 miles flown). A journey running Beijing – Shanghai – Guangzhou – Beijing will cost US$560. The Europe pass allows an unlimited number of coupons. For each coupon a fare between US$60 and US$205 is charged depending on the distance flown. Before purchasing this pass it is worth checking the price of the individual flights, which are often marketed at a lower fare. Qantas in co-operation with British Airways offers a reasonably priced Business Class RTW, which is sold for £3,695 plus taxes and surcharge. Minimum stay is 14 days and the maximum validity is a year. Passengers can expect seven stopovers with a maximum of three in Australia. An example of this routing could be Hong Kong – London – New York – Los Angeles – Auckland – Hong Kong. Other options include, London – Singapore – Sydney – Auckland – Fiji – Los Angeles – London, and New Delhi – Bangkok – Melbourne – Cook Islands – Los Angeles – London – Delhi. From Thailand you might try Bangkok – Singapore –Brisbane – Cook Islands – Los Angeles – London – Bangkok. The local price in various originating cities will differ from the standard £3,695 fare due to fluctuating exchange rates and currency regimes. These journeys need to be booked at least 28 days before commencement of travel. Then there is the mega-grouping behemoth called Star Alliance (www.staralliance.com). This embraces airlines and operators like Air Canada, Austrian, Scandinavian, THAI Airways, Air New Zealand, bmi (British Midland), Singapore Airlines, United, ANS, LOT, US Airways, Asiana, Lufthansa, TAP and VARIG. Star Alliance offers a special RTW allowing between three and five stopovers for £1,967 plus taxes (these could add up to approximately 200 pounds) and up to 29,000 flown miles are allowed. Singapore Airlines levies a surcharge of between US$300 and US$900 on longhaul segments flown on certain types of aircraft such as the Airbus A380. Taxes and surcharges have to be added. These can easily total as much as A$1,000 or more. Baggage allowance in economy and business class is two pieces of up to 23kg each. First class gets two pieces of 32 kilograms each. Any changes in dates or carriers or flights, is free, but re-routings incur a fee of around US$125. Because of fluctuating exchange rates, in other countries the fares might be slightly higher or lower than these fare equivalents. Examples of possible routings include, 29,000 miles covering Singapore – Sydney – Auckland – Papeete – Los Angeles – Montego Bay – Philadelphia – New York – London – Munich – Madrid – Rome – Singapore; up to 34,000 miles doing Bangkok – Johannesburg – Victoria Falls – Johannesburg – Cape Town – London – Warsaw – Budapest – Munich – Paris – Chicago – Vancouver – Honolulu – Sydney – Bangkok; or 34,000 miles of air credit taking in the sights, sounds and smells of Singapore – Athens – Frankfurt – London – New York – Miami – Rio de Janeiro – Mexico – Los Angeles – Honolulu – Sydney – Singapore. This is by no means a complete list of all available possibilities. And the prices quoted here are subject to regular change. Use them as a rule of thumb to examine relative costing. If you are planning a round-the-world holiday, contact your travel agent or airline. They will have more interesting options available.